A Class B AIS transponder requires a dedicated GPS antenna (all Class B units must have their own internal GPS and can't use an external feed for regulatory purposes) as well as a VHF antenna or suitable VHF-AIS antenna splitter. 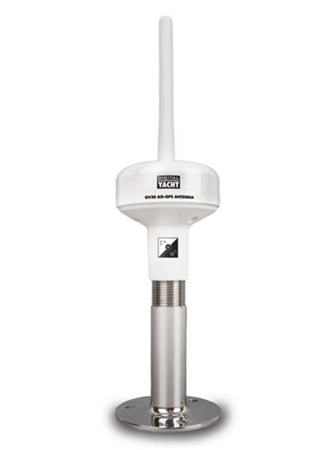 The GV30 is a combination VHF/AIS and GPS antenna with twin coax feeds (10m). It is fitted with a standard 1" threaded base so will mount onto a variety of deck, pole and rail attachments available from many 3rd party suppliers. The 10m coax cables are terminated with an FME mini connectors which make running the cable easy, as the connector is barely larger than the 5mm cable. We then supply suitable adaptors for the TNC and BNC connectors on our AIT2000. The GV30 is just 190mm high and 75mm in diameter. Despite its compact dimensions, it offers very good performance as it is specifically tuned to 162MHz (AIS frequency). The GV30 is also available with the AIT2000 as a bundle.